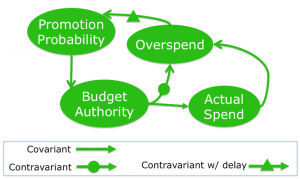 In deciding whether or not to undertake technical debt retirement projects, organizations are at risk of making inappropriate decisions because of a synergy between the reification error and confirmation bias. Together, these two errors of thought create conditions that make committing appropriate levels of resources difficult. And in those cases in which resources are committed, there is a tendency to underestimate costs, which can lead to an elevated incidence of failures of technical debt retirement projects. The reification error might be responsible, in part, for a widely used management practice that often appears in the exploratory stages of undertaking projects. Let’s start with an illustration from the physical world. A feedback loop that now provides budgetary control in most organizations. In the physical world, when we want cherries, we go to the produce section of the market and check the price per pound or kilo. Then we decide how many pounds or kilos we want. If the price is high, we might decide that fewer cherries will suffice. If the price is low, we might purchase more cherries. We have in mind a total cost target, and we adjust the weight of the cherries to meet the target, given the price. In the physical world, we can often adjust what we purchase to match our ability to pay for it. Retiring technical debt doesn’t work like that, in part, because technical debt is an abstraction. But we try anyway; here’s how it goes. Management decides to retire a particular class of technical debt, and asks an engineer to work up an estimate of the cost. Sometimes Management reveals the target they have in mind if they have one; sometimes not. The estimate comes back as Total ± Uncertainty. Management decides that’s too high—or the Uncertainty is too great—and asks the engineer to find a way to do it for less, with less Uncertainty, maybe by being clever or doing less. Management—the “customer” in this scenario—makes this request, in part, based on the belief that it’s possible to adjust the work to meet a (possibly unstated) target, in analogy to buying cherries in the produce department. That thinking is an example of the reification error. In this dynamic, we rarely take into account the fact that retiring technical debt isn’t exactly like buying cherries. Now back to the interaction between Management and estimator. The engineer now suspects that Management does have a target in mind. Some engineers might ask what the target is. Some don’t. In any case, the engineer comes back with a lower estimate, which might still be too high. This process repeats until either Management decides against retiring the debt, or accepts the lowest Total ± Uncertainty, hoping for a final cost that isn’t too high. In adjusting their estimates, engineers have a conflict of interest that can compromise their objectivity through the action of confirmation bias. In the case of technical debt retirement efforts, engineers are usually highly motivated to gain Management approval of the project, because the technical debt in question depresses engineering productivity and induces frustration. And since engineers typically sense that Management approval of the project is contingent on finding an estimate that’s low enough, the engineers have a preconception. That is, they have an incentive to convince themselves that the budget and schedule adjustments they make are reasonable. Because of the confirmation bias, they tend to seek justifications for the belief that lowering costs and tightening schedules is reasonable, while they tend to avoid seeking justifications for believing that their adjustments might not be feasible. That’s the confirmation bias in action. So, because of the reification error, Management tends to believe that the work needed to retire technical debt of a particular kind is more adjustable than it actually is. And because of confirmation bias, engineers tend to believe that they can do the work for a cost and within a schedule that Management is willing to permit. Too often, the synergy between the two errors of thinking provides a foundation for disaster. Management usually interprets estimates as commitments. Engineers do not equate estimates with commitments. Management usually forgets or ignores the upside Uncertainty. So typically, when Management finally accepts an estimate, the engineering team finds that it has made a commitment to deliver the work for the cost Total, with zero upside Uncertainty. Few engineering teams are actually asked to make an explicit commitment to perform the work for a cost Total with zero upside Uncertainty. An analogous problem occurs with schedule. By ignoring the Uncertainty, Management (the buyer) transfers the uncertainty risk to the project team. That strategy might work to some extent with conventional development or maintenance projects, where we can adjust scope and risk before the work begins. But for technical debt retirement projects, this practice creates problems for two reasons. First, with technical debt retirement we’re less able to adjust scope. To retire a class of technical debt, we must retire it in toto. If we retire only some portion of a class of technical debt, we would leave the asset in a mixed state that can actually increase MICs. So it’s usually best to retire the entirety of any class of technical debt, so as to leave the asset in a uniform state. Second, the work involved in retiring a particular class of technical debt is more difficult to predict than is the work involved in more conventional projects. (See “Useful projections of MPrin might not be attainable”) Often, we must work with older assets, or older portions of younger assets. The people who built them aren’t always available, and documentation can be sparse or unreliable. Moreover, it’s notoriously difficult to predict with accuracy when affected assets must be temporarily withdrawn from production—and for how long—to support the technical debt retirement effort. Revenue stream interruptions, which can be significant portions of total costs, can be difficult to schedule or predict. Thus, technical debt retirement projects tend to be riskier than other kinds of projects. They have wider uncertainty bands. Ignoring the Uncertainty, or trying to transfer responsibility for it to the project team, is foolhardy. In that post, I summarized Meadows’ idea that to alter the behavior of a complex system, one can intervene at one or more of 12 categories of leverage points. These are elements in the system that govern the behavior of the people and institutions that comprise the system. In that post, I sketched the use of Leverage Point #9, Delays, to alter the levels of technical debt in an enterprise. One feedback loop at issue in this case, illustrated above, provides budgetary control. It influences managers who might otherwise overrun their budgets by triggering some sort of organizational intervention when they do overrun their budgets. And it leads to increases in the portfolios of managers who handle their budgets responsibly. Presumably, that’s why managers compel estimators to find approaches that cost less. The feedback loop to which managers are exposed causes them to establish another feedback loop involving the engineer/estimator, and later the engineering team, to hold down their estimates, and later their actual expenditures. We can use a diagram of effects [Weinberg 1992] to illustrate the feedback mechanism commonly used to control the performance of managers who are responsible for portfolios of project budgets. In the diagram, the oval blobs represent quantities indicated by their respective captions. Each of these quantities is assumed to be measurable, though their precise values and the way we measure them are unimportant for our rather qualitative argument. Notice that arrows connect the blobs. The arrows represent the effect of changes in the value represented by one blob on the value represented by another. The blob at the base of the arrow is the effector quantity. The blob at the point of the arrow is the affected quantity. Thus, the arrow running from the blob labeled “Actual Spend” to the blob labeled “Overspend” expresses the idea that a positive (or negative) change in the amount of actual spending on projects causes a positive (or negative) change in Overspend. When a change in the effector quantity causes a like-signed change in the affected quantity, we say that their relationship is covariant. Because increases in Budget Authority tend to decrease Overspend, all other things being equal, the relationship between Budget Authority and Overspend is contravariant. We represent a contravariant relationship between the effector quantity and the affected quantity as an arrow with a filled circle on it. As Overspend increases, after a delay, the Probability of Promotion decreases. This causes reductions in Budget Authority because, presumably, the organization has reduced faith in the manager’s performance. Reductions in Budget Authority make Overspend more likely, and round and round we go. As Overspend decreases, after a delay, the Probability of Promotion increases. This causes increases in Budget Authority because, presumably, the organization has increased faith in the manager’s performance. Increases in Budget Authority make Overspend less likely, and round and round we go. Fortunately, other effects usually intervene when these self-re-enforcing phenomena get too large, but that’s beyond the scope of this argument. For now, all we need observe is that managers who manage their budgets effectively tend to rise in the organization; those who don’t, don’t. The result is that managers seek to limit spending so as to avoid overspending their budget authority. And that’s one reason why they push engineers to produce lower estimates for technical debt retirement projects. To break the connection between the managers’ reification error and the engineers’ confirmation bias, our intervention must cause the managers and the engineers to make calculations differently. We can accomplish this by requiring that they consider more than the mere cost of retiring the class of technical debt under consideration. They must estimate the consequences of not retiring that technical debt, and they must also estimate costs beyond the cost of retiring the debt. In what follows, I’ll use the shorthand TDBCR to mean the class of Technical Debt Being Considered for Retirement. Specifically, the estimates that are now typically generated for such projects cover only the cost of performing the work required to retire the TDBCR. It’s then left to Management to decide whether, when, and to what extent to commit resources to execute the project. The primary consideration is the effect on the decision-maker’s budget, and the consequences for achieving the goals for which the decision-maker is responsible. Since the retirement project can potentially provide benefits beyond the manager’s own portfolio, failing to undertake the project can have negative consequences for which the manager ought to be held accountable. That’s the heart of the problem. So let’s look at some examples of considerations that must be taken into account. And these items might not be related to anything for which the decision-maker is responsible. That’s the core of the problem we now face: the feedback loop we now use to influence the decision-maker excludes considerations that are affected by the decision-maker’s decisions. Until we install feedback loops that cause the decision-maker to consider these consequences, or until we make decisions at levels that include these other consequences, the effects of the decision-maker’s decisions are uncontrolled, and might not lead to decisions optimal for the enterprise. [McConnell 2006] Steve McConnell. Software Estimation: Demystifying the Black Art. Microsoft Press, 2006. [Meadows 1999] Donella H. Meadows. “Leverage Points: Places to Intervene in a System,” Hartland VT: The Sustainability Institute, 1999. Available: here; Retrieved: June 2, 2018. [Weinberg 1992] Gerald M. Weinberg. Quality Software Management Volume 1: Systems Thinking . New York: Dorset House, 1989.